Be not afraid. I r JesusCat. 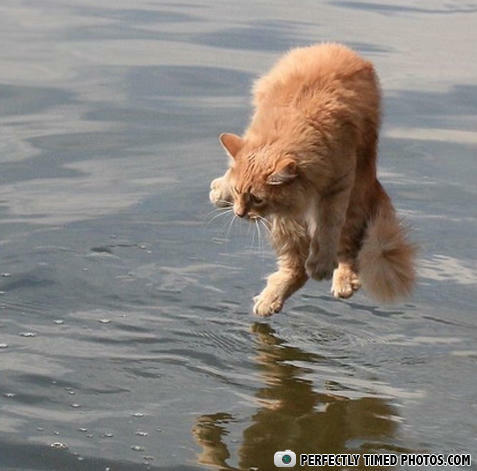 Jesus walks on water, cats dances over it. After heaven began to get a little boring, Jesus decides to revisit earth as a cat. Ninja Cats travel in shadows at night over water at day!! WHO`S YOUR GOD NOW !? Since his death, Jesus has been experimenting with new bodies. Aww I was gonna say that D: Oh well DONT BE AFRAID IM JESUSES CAT!!! I feel like dancing, dancing!! looks like he got hit with an invisible kame-hame-ha! A cat will defy physics just to avoid a bath. cats: they can freeze time. Hmm I wonder how he got there? Thats one chucked kitty. Not Funny - Cat obviously been thrown towards water! Not funny - ct obviously being thrown at/into water! No John. I cant come back to land. I MUST DANCE!!!!!! Who throw the Cat in the Water? DON'T DROP ME DAMMIT!!! UP!! PICK ME UP!!!! The grandfather's grandson said, "They charged me $10 just for a cup of coffee!" The grandfather said, "They charged me with bayonets."